On Tuesday the 1st of November 2012 I attended a busy public exhibition to view plans for a proposed development behind 231-247 Milton Road in Cambridge. The plan is to demolish a property to provide access to back gardens on which thirteen three bedroom homes are proposed. The image associated with this article shows the plan presented at the exhibition. My prime concern is the junction with Milton Road. At the exhibition the developers said their estimate was just 50 car movements per day and claimed there would be no impact on Milton Road. My view however is this is a complex area of road and I am particularly concerned about right turning traffic entering the development creating a hazard. As a main road in and out of the city of Cambridge I think it’s important not to create undue complexity and confusion with too many junctions. There is clear practical access to this site, if it is to be developed, from Woodhead Drive, most obviously via Robert-Jennings Close, or by demolishing an alternative property. This “rear” access route allows use of the right turn into Woodhead Drive from Milton Road which has a substantial place to wait in the middle of Milton Road to wait to turn in safety and without disrupting the traffic flow. The developers claimed this would be difficult due to the fact Robert-Jennings Close is privately owned, and not by them. My view is this is something developers could and would negotiate if councillors made clear such an access would be required in order to secure planning permission. The proposal is to create a private road, with according to the developer’s representatives at the exhibition, an access with a feel of a private drive to the development, rather than a road. Questioned on why this option was chosen (querying if the developer thought buyers had a preference for private roads) the developer’s representative was very up front in admitting it was simply cheaper to build a private road as it didn’t have to be to the standards required by the County Council for adoption as a public road. I oppose the creation of private enclaves in the city and think new developments should be genuine extensions of the city and should be publicly accessible. Private roads create problems for future residents who have to club together to maintain the roads and verges etc. On a number of occasions residents have struggled to come to consensus and some residents (especially elderly ones) have been unable to raise money required to contribute to maintenance and we’ve had odd situations of the city council stepping in to put public money into maintaining the private roads. Residents end up paying their taxes and having to pay again, via service charges, for maintenance of their roads, verges, lighting etc. If the development is permitted I think the developer ought be required to build the road to adoptable standards; and the road, and streetlights, ought be in place and safe before residents move in. Like many developments there is no proposed public way through. I think councillors fail to consider how people want to get around the city when allowing dead-end developments. Woodhead Drive is particularly bad with no-foot / cycle route out to the south towards the city centre. I would like to see at least a path through to the rear providing relatively traffic free routes out to the public open space and play areas off Woodhead Drive and routes beyond via the path towards Arbury. The proposed access road, or as the developers prefer to call it, driveway, crosses the very busy off-road cycleway on Milton Road. Assurance was given to me, and others, at the exhibition that cyclists would be given right of way and the roadway would step up to the level of the cycleway which would remain level. As elsewhere on the road, we were told cyclists on the cycleway would be given right of way, and signage would indicate drivers need to “give way”. f. prejudice the comprehensive development of the wider area of which the site forms part. There are relatively few Cambridge homes with reasonably sized gardens; this development reduce this number further. The new homes will have very small gardens and the size of the gardens of the existing properties will be substantially reduced. I think the city needs a diverse range of housing stock. Cambridge needs more homes, and more affordable homes, but it’s not just about numbers, we need homes which it is practical to live in, for life as well as those suiting people spending a few years in the city. Cambridge needs to have a housing stock which enables people to find appropriate housing which they can afford; at the moment we’re failing miserably on that count. The gardens on which the development is proposed currently contain a large number of substantial trees; some of which the developers propose to retain but many will need to be felled. Trees, especially established ones, in an urban environment are immensely valuable; their presence between properties which back onto each other provide a feeling of privacy and seclusion; following the development it will be much more starkly clear that the city is a place where people are living very close together in dense housing. It is not sensible to keep trees in order to obtain planning permission; some trees which are to be retained may, within a few years of occupation, need to be drastically reduced in size in order to make the homes practical and pleasant places to live. This isn’t a terrible scheme; it would provide what look to be reasonably sized homes in a city and an area where they are much needed. I think councillors should rarely intervene in the economics of the free market; and if people want to sell their back gardens for the price offered, their role in a case like this ought be merely checking any proposed development is not unacceptable (though I’d like to see them taking a more proactive planning role too). Plans adapted to provide vehicle access from the rear; and perhaps a foot/cycle path through the development. The development built to be adopted by the council, with the road as public highway, and streetlights up and working from the point of first occupation. Payments made to the council to reduce the impact of the development to be avoided by provision eg. of green space on the site or very near-by and by making direct contributions to directly related improvements eg. of local junctions. Personally I’d only like to see such taxes levied to pay for public works without which the development would be denied planning permission. Bungalows considered for some of the plots. I note bungalow prices in the area are higher than much larger houses, so that might make economic sense. The plans will probably be changed before a planning application is made. As they are I’d say they are on the edge of being acceptable or not; which probably reflects what the developer will be doing – trying to push the council as far as possible and to get as dense and profitable a development approved as possible. Where the proposals are unacceptable councillors do have to push back against developers, in the interests of all the city’s residents. I live on Milton Road; though not in a property neighboring this development. My house is further down the road on the other side. This entry was posted on November 2, 2012 by Richard Taylor. The access from Robert Jennings Close is a good idea and a walk and cycle route through is a brilliant suggestion. However, the developer’s won’t want others to walk or cycle through their development, which rather highlights your point about private enclaves. However, if the developer’s gained access to Robert Jennings Close and the only access for the 50 trips per would be through Woodhead Drive they should be able to safe a house on Milton Road and reduce the amount of land used for the access “driveway”. That should give them funds to negotiate with the “Kings Street Housing Society” who own Robert Jennings Close. I can’t find any other reference online to “Woodhead Drive and Milton Residents” so perhaps it is a group set up specifically to object to this application? The Highways Authority has already commented, it strongly opposes a number of elements of the proposal and recommends refusal. There are no details; but for the reasons I’ve noted in my article above this worries me, and I would also object on the grounds the County Council are not prepared to take the road on. It opposes the pavement only being on one-side of the proposed new road into the development. It states Milton Road is a primary radial route for the City and it is inappropriate to introduce a shared surface environment straight from such a route. It states the proposed road markings would “provide contradictory information to drivers” and says it “would not countenance a give way marking coming off Milton Road, on public highway as the layout is unsuitable and would have severe safety implications”. The protection of the pedestrian and cycle route on Milton Road is essential; I would oppose anything which makes conditions worse on the cycle way or footpath. Ideally access to any new development would be from the rear, not from Milton Road, if there was to be a new access on to Milton Road I would like to see City and County Council experts getting involved in designing the junction, it appears crazy to me that we are relying on developers to come up with a design for such a sensitive area and then leaving the councillors to approve it or not, I would like to see the councils being much more proactive. I also note the proposal involves felling almost fifty trees. (At least one of those listed is dead, and many are small, but there are a good number of substantial, valuable, trees too). Complaints that the consultation is being carried out over Christmas and New Year when people might be likely to be away or distracted appear valid to me. I think consultation periods ought be extended at this time of year (and in August too). My view is that while a development may be acceptable in this location; the current proposal ought be rejected. I think the current proposals are an attempt to see if councillors will let the developers get away with an unsuitable access to the site, excessively dense development, and cheaply built road environment and I would like to see councillors stand up to the developers and insist that if there is to be development here it is carried out in a more appropriate manner. I expect councillors will be balancing the provision of much needed housing against the negative impacts of the proposals on the local area, especially the road and cycle way. My view is a rejection ought not be equated to a loss of the proposed housing as it is likely the developer will return with a more acceptable proposal in light of comments made during this process. My view is that access from Woodhead Drive or Robert-Jennings Close would be greatly preferable to the proposed access from Milton Road. Current land ownership should not be a factor which councillors consider. I would also suggest the road within the new development be adopted, and lit, and a path through the site opened for pedestrians and cyclists through the site between Milton Road and Woodhead Drive. Considering including bungalows in a future proposal would be appropriate. The current application ought be rejected on the grounds of policy 8/2 “Transport Impact” as Milton Road is a key route in and out of the city and a further junction would increase the complexity of the road environment reducing safety. Right turning vehicles in particular would both create a hazard and create additional congestion. I agree with the comments made by the County Council as Highways Authority recommending refusal; and would like to see councillors give significant weight to the views expressed in their submission. I oppose the use of a blocked (bricks) surface, rather than smooth for the cycleway as it crosses the entrance to the site. This is on the path of the current cycleway so will presumably be adopted; brick surfacing of this nature on the public highway tends to be allowed to deteriorate in the city, there are often missing or raised bricks, as regularly seen for example on Sidney Street, this is not ideal for a popular cycle route. The application ought also be rejected on the grounds of policy 8/5 “Pedestrian and Cycle Network” on the basis it will have a significant negative impact on the popular off-road cycle path on Milton Road which the access to the proposed development will cross. The popularity of the cycle-path is in part due to the fact it has a reasonably long length without significant crossings at which cyclists have to lose momentum and be prepared to stop at junctions, an additional junction will reduce the utility of the off-road path and I would expect it to result in more cyclists opting to use the road. I note that to cycle safely cyclists need to be prepared to stop if they technically have the right of way or not. I note the visibility splay described and depicted in the applicant’s transport statement appears not to relate to the cycle path; it starts from the point where an egressing vehicle would be half way on the cycle path. The key aspects relating to visibility in my view are how early a cyclist can spot a vehicle leaving the development, and how early a driver leaving the development can see a cyclist on the cycle path; these points have not been addressed. The application ought be refused as the proposed private enclave is directly at odds with policy 3/4 “Responding to Context” which requires new developments “be well connected to, and integrated with, the immediate locality and the wider City”. Development at this location including public highway with foot and cycle access between Woodhead Drive and Milton Road could comply with this policy, however the proposals as they stand do not. While private enclaves exist elsewhere in the city they are out of character for this area. While the council’s current planning policy doesn’t appear to have anything specific to say on creation of private roads / private enclaves vs extensions of the city based on public highways I think permitting them would be contrary to the general aims of policy 3/7 “Creating Successful Places”. I think councillors should consider the impact on future residents of living in a private road and having to contribute to its upkeep as well as paying council tax to contribute to the upkeep of the wider city. I note that residents of private roads in North Cambridge have approached the council asking for assistance. My concern is that private roads store up costs and sources of dispute for future residents; as well as denying the wider population access to, and through, the area. I would like councillors to consider the impact on those houses which would lose their gardens to provide the land for the proposed development. Policy 3/10 on the “Sub-division of Existing Plots” states development in gardens will not be permitted if it would “detract from the prevailing character and appearance of the area”. Milton Road is characterised, particularly along this stretch, by homes with good sized gardens. In the context of an expanding Cambridge city homes with substantial gardens are forming a smaller proportion of the housing stock as flats and smaller homes have predominately been built where the city has been extended. I think that to enable, and encourage, a diverse range of people to live their lives in the city, and to spend more of their lives in the city rather than moving on, there is a need for a variety of housing stock, including houses with substantial gardens. The size of gardens in the area and the number of trees within them contributes to a feeling of not being in a densely populated urban area; particularly when in, or looking out onto, the back gardens. I think the loss of trees will exacerbate the impact of the densification of housing in the area. I think the development ought be lit; so future residents feel safe and to make it a practical place to live. Ideally this would be by public street lights which are installed and working before the first properties are occupied. If the application is approved I suggest a condition ensuring the safe operation of the cycleway during the development, by doing the work on the junction first. The roadway within the site ought be finished and safe prior to occupation of the homes. I can’t see a notice posted on Milton Road near the site anywhere; and I’ve cycled along specifically looking for it. Update: 6 Jan there is a notice on a lamppost now, but it is not very prominent. The application is on the agenda for the 6 March 2013 planning committee. As an objector I have not yet been informed of this by the council. Council officers are recommending councillors approve the proposal. It appears that amended plans, which I as an objector have not had drawn to my attention, have been submitted. I think this is a significant systemic failure as I may have wished to comment further on the impact of the revisions, perhaps expressing a view on if they do, or do not, address my concerns. Astonishingly despite the city council employing a huge team of people dedicated to trees they have not commented on this application – there are significant numbers of trees, some of which have tree preservation orders on them, affected. The council officers preparing the report to councillors appear dismissive of the public comments on the application; they have briefly summarised the subjects of the objections but not their content. My objection to creating a private road is ignored completely. Over £50K of development taxes are proposed related to education, and another £40K for transport. I think this is a terrible dampener on the housing market and a tax on those who don’t have somewhere appropriate to live in the city. Those who will move into the properties will be paying, and will have paid, the full gamete of other taxes paying their contribution to state funded education and transport. Cycling is only mentioned in the context of the revised plans incorporating larger garages intended to provide space to store bikes (presumably in addition to cars). In my experience few people now keep cars in their garages (modern cars are essentially entirely weatherproof and survive being kept outside). A huge amount of detail about the design of this development yet I can’t see any mention of the additional danger to cyclists and pedestrians on the Milton Road shared use path that this development will sever. The few motor vehicles accessing this development get priority over the many pedestrians and cyclists on Milton Road. Very disappointing. I assume that’s a comment on the officer report and not my article. This arrangement needs to be the norm in the UK, not the Barton Road -style ‘Give way and look in 5 directions’ arrangement used in Cambridgeshire. I observed Cambridge City Council approve planning permission for the proposed development on the 6th of March 2013. Only four councillors were present for the decision: Blencowe, Brown, Tunnacliffe and Hipkin. Cllrs Stuart, Dryden, Marchant-Daisley and Saunders were absent for the item, and reserves Cllrs Herbert and Tucker were not present either. The approval was passed by a 3:1 vote with Cllr John Hipkin voting against. In the past such low attendence rates at area committee planning meetings have prompted a rebuke of the absent councillors by the council leader; however in the area committee case some were objecting on principle, either to making decisions on area committees, or about having their hands tied by the rules governing planning decisions. I used the public speaking opportunity to express concern, as detailed in the above article, about the disruption of the off-road cycleway. I noted it was a popular, strategic, cycle route. I noted the utility of the off-road path was enhanced by there being quite a long stretch where there are no side roads, and suggested this made it attractive whereas if it was broken up cyclists could be more tempted to use the road. Officers, and Cllr Blencowe, stated they had good knowledge and experience of the cycle path. Cllr Blencowe said that the path was already crossed by side roads and drives so cyclists using it would have to be aware of such hazards. Officers stated the county council had considered the volume of predicted movements was too little to make my objection valid. Officer Dyer gave councillors the impression I had only made my comments the day before when I had in-fact made them two months earlier, on the 2nd of January. What I expect she was actually saying in effect was that it was only my registering to use the public speaking slot which had prompted the consideration of my comments by city council officers, and them seeking the county council’s view on them as the highways authority. Cllr Brown appeared to grasp that the problem is if you as a cyclist cannot see it is safe to proceed over the junction you have to slow down, lose momentum and that this is a problem regardless of the volume of traffic using the junction. Cllr Brown asked if the application was, in the view of officers, really in line with the council’s planning policies on transport (despite their recommendation for approval). Despite speaking in such a way that made it sound as if she grasped the matter Cllr Brown voted to approve the application. My presence using the public speaking slot at the meeting at least got some consideration given to the impact on the cycle path. No mention of the impact of the development on the rest of the road, beyond the cycleway, was made. @cotnm @rtayloruk I asked specifically about collisions. We’ve added a visibility condition before development can go ahead. I also raised the fact the development is to be a private road. I suggested this was out of keeping with the area (as this is a planning reason to reject an application). I suggested that a public adopted road, lit by publicly funded streetlights, with a path through the site, would be in-keeping. Cllr Tunnacliffe took up this point; though only to the extent of clarifying with the officer that it is true – there is no intent for the road to be adopted. He was told that the quality proposed was too poor for the county council to adopt, and there was no intent for this adoption to happen at any point in the future. Cllr Tunnacliffe also noted that there was nothing stopping a gate being installed on the development at some point; though he said this would be against the council’s policies (I’m not sure that’s true, that’s just what the councillor said). During debate Cllr Hipkin raised the issue of the size of “amenity space”, by which it turned out he meant, “gardens”, for the proposed properties. He was told by officers there was nothing in the local plan about garden size, and it was a judgement call. Cllr Hipkin said he judged them too small; he said he would expect families to move into some of the properties, given they were to be substantial 3 bed houses. Planning officers noted the density of development was less on this site than it is on the new developments around the fringes of Cambridge, and homes there had similar sized gardens. Officers suggested it would be hard to object to something on this site which the council was approving in the new developments on the outskirts of the city. Cllr Sarah Brown said that she had a smaller garden than those proposed and was able to fit a fish pond and grow some veg in hers, so she was happy with the garden sizes. Cllr Brown stated the days of living in an urban environment with substantial gardens were over. Cllr Blencowe stated he would need to win the lottery to be able to afford to live in one of the houses to be built on the site. There were three of us who had registered to use the public speaking slot at the meeting. The meeting’s chair, Cllr Blencowe offered us six minutes between us. When this kind of thing happens it’s often difficult because whoever goes last (in this case it was me) is often left without any time; although the chair was generous in this case I spoke for less than a minute. One speaker complained about dormer windows and overlooking. Officers responded to say there were no dormer windows planned, just roof lights. That speaker also said bungalows would be more suited to the site, and he pointed to where developments in back gardens nearby have been of bunglows; his argument was that bunglows in such an area would be in-keeping and in character with the area whereas the proposed development would not be. The other speaker, an elderly man who wore a black tie with the Cambridge City Council crest on it, introduced himself as the resident of one of the properties which will be next to the new access road. He drew attention to a proposal to drop the curb and create a splay in-front of his property. Officers dismissed this as being a concern relating to an area outside the “red line” delineating the area to which the application refers. This speaker expressed concern about the access both to his property, and the proposed development, suggesting a traffic warden would be permanently required to be on duty to let people in and out. The council’s tree officers provided a late report which was tabled at the meeting (and not available in advance online, or on the application’s page on the council website, and not drawn to the attention of objectors). This noted the loss of two “b” category trees; which was explained as being pretty significant specimens. The city council will also have to approve a method for bins on the site to be emptied as a condition of the planning permission. I hope we don’t see all 13 properties bins on Milton Road and if a bin lorry can’t safely get in and out of the proposed development the permission is not formally granted. The planning officer noted an error had been made in the calculation of the amount of tax payable for primary education and corrected the figure from £42,400 to £16,200. 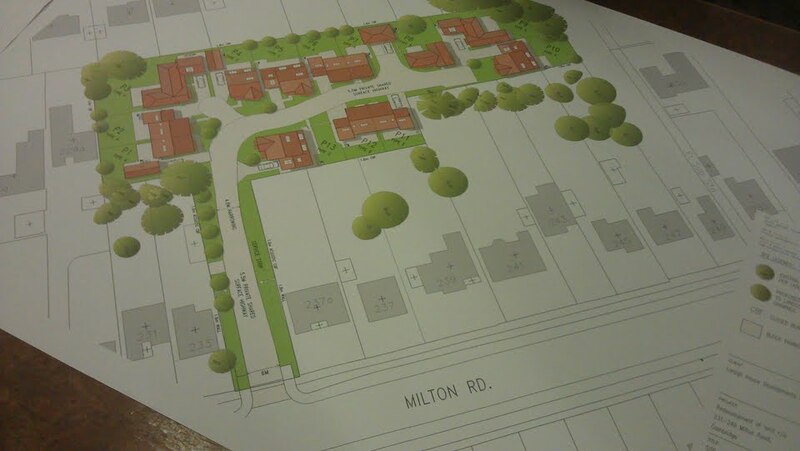 …pedestrians and cyclists on Milton Road have priority over vehicles accessing and egressing the proposed development. 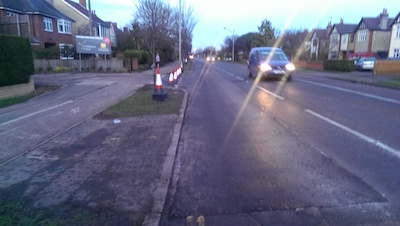 Give-way markings within the site could be utilised to further ensure that vehicles egressing the site are aware that pedestrians and cyclists on Milton Road have priority. The presence of the give way road markings on the cycle way make it more like a cross-roads with those approaching from all directions expected to give way to each other; except those coming off the main road – who cyclists are expected to give way to. Ideally we’d have a well marked cycleway – perhaps say in red with white edges, crossing this and other minor junctions, and the standard requirement would be for motorists to give way to cyclists on the path. The approval was conditional (as I understood it, I wouldn’t be surprised if the minutes show something different) on the completion and approval of a “road safety assessment”. The meeting was told this would be carried out by the developers and the county council working together. I am writing to you to ask if there’s anything you can do to get this process of conducting the road safety assessment and assessing its outcome to take place as openly and transparently as possible. It’s hard to make FOI requests for documents when I don’t know when they will be produced. I am concerned about the impact on the cycle way in particular, and Milton Road more generally, of the development. I don’t know, but presume, if a “road safety assessment” acceptable to Cambridge City Council officers cannot be produced the application will have to go back before councillors, or perhaps that condition will simply fail to be met. I suspect I am not the only person interested in this; at least one of the immediate neighbours of the proposed new entrance is very concerned about safe access to the new development and his own house (he spoke at the planning committee). Perhaps the Cambridge Cycling Campaign could also be approached to provide input to the road safety assessment? My own view is accessing the site from the rear would have been massively preferable over an access from Milton Road. 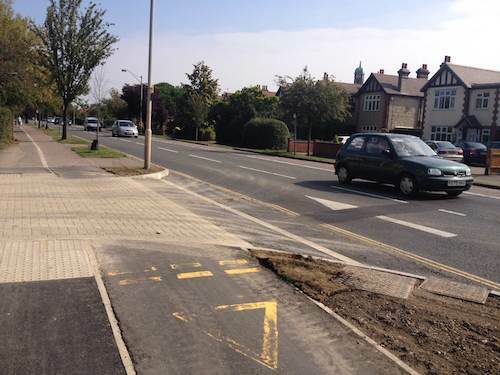 Perhaps “failing” a “road safety assessment” could still prompt this; however if we are to have an access from Milton Road I think the key thing is to get enable cyclists on the cycle path to see any vehicles emerging from the development from as far away as possible (and vice versa). I also don’t think bricks will prove in the long term to be the safest surface for a cycleway on the grounds they are hard to maintain, and often bricks are missing in older brick surfaces, particularly in places where they have heavy vehicles such as refuse trucks going over them regularly. @rtayloruk @cllrsarahbrown We didn’t see the change and would have objected. Original design was correct. @cllrsarahbrown Another objector did. We shouldn’t have to be spending time on such basic problems. Key example why Cycling Officer needed. @cllrsarahbrown @cambscc “Approved subject to.. Agreement of revised plan maintaining cycle priority over sideroad at junction”. Why not? Many members of the planning committee weren’t present for the item, the reserve councillors didn’t replace them, and no councilors explained their votes at the time. Against that background there’s a need to be careful when commenting on Cllr Brown’s approach and reasoning to appreciate she is the only councilor being communicative so the only councillor it is possible to engage with on these points; she may be only as bad as the others, or the others may be worse – they just keep quiet. @camcycle I didn’t receive a single email about it. I got over 60 on Wilton Terrace. That’s effective lobbying. I felt I had made a representation; by writing an objection and speaking in person at the committee to back up, and stress, what I had written, something I thought was particularly necessary an justifiable given my major concerns were not addressed in the officer report. I was surprised by Cllr Brown’s dismissal of this as ineffective lobbying and the suggestion that the number, and not the substance of objections, is something she takes into account. Cllr Brown and the Liberal Democrats have been elected on a pro-cycling manifesto and the council’s transport policies in the local plan are also pro-cycling. Given the manifesto and local plan I would have expected the impact on the cycleway to have been a key consideration even without any objections or lobbying on the point. @rtayloruk I doubt any councillor sits down and reads the individual representations for every planning app. That’s what report is for. When we had paper planning files councillors were regularly in the Guildhall looking through the representations which had been made on an application. I have observed a number of debates on councillor allowances and the time it takes to read planning files has often been cited as a justification for the additional allowances members of the planning committee receive. If Cllr Brown isn’t reading the planning files she is missing out on key information from applicants and objectors and can’t in my view be in a good position to make a judgement on an application. I think she should hand back her extra allowance, and cease taking it. Given councillors maintain the expensive online system for managing comments on planning applications I’m surprised to see them encouraging direct, private, lobbying. I think it’s much better to have openness and transparency and to have all comments on a planning application made in public, so they can be debated. I’ve observed members of the public speaking at committees making planning decisions referring to emails they’ve sent councillors; and generally I’ve got the impression councillors in general have been dismissive of such approaches. I’ve considered those who write to members of committee’s in this way, as usurping due-process and trying to get around rules such as those preventing objectors circulating/presenting images or plans to councillors at committee meetings which have not been included in official, public objections/comments. I wonder if the move to an all-digital planning file has made it harder for councillors to quickly flick through objections. I’d like to see councillors involved in planning decisions asked in public what effect the move to an all-digital system has had on the way they approach their role. I think Cllr Brown has provided a fascinating insight though her tweets. I would feel uncomfortable writing to all members of a committee directly when councillors have set up a system for formal consultation though which comments from the public can be channeled. I would be concerned I would be seen as trying to evade the process; I would have thought other councillors might be relatively dismissive of such approaches. I always try to lobby via what I consider proper, proportionate, means. Writing to all councillors on a committee would feel to me like a disproportionate way to make a comment or objection on a planning item. As the pavement and cycleway is outside the “red line” to which the planning permission relates; what happens with it isn’t constrained by the planning permission – there ought still be the ability to get it right. Looks like the only option now is to lobby County councillors on the issue? A further planning application has been submitted in relation to this development. An additional house is proposed at the end of the approved development. Oddly this time I have not been specifically consulted as a near neighbour whereas I was in relation to the initial application, even though the proposed new property is nearer to my house than those previously approved. Cambridgeshire County Council have replied to the consultation with a “no comment” response; they didn’t provide an update on the progress of the “road safety assessment” to which the already approved development is subject. This is just one additional house on the development; I think there is potential for many more. I am concerned that councillors approved the original development’s access arrangements on the basis of one size of development but what we ultimately get might be quite different. This whole application seems backhanded why was it not applied for when the larger application was submitted? Following our enquiry, the Local Planning Authority did not supply a copy of the schedule or plan identifying which trees are covered under the above order, as such, it has not been possible to identify the protected trees within this report. On a positive note; I am very impressed with the quality of design details on physical structure of the property proposed. My understanding is that the planning application ( 12/1537/FUL ) for the rest of the new estate to which the proposed new property is to be added is subject to a condition requiring a “road safety assessment” to be produced by the developer in conjunction with the county council and reported back to the city council. I would suggest the satisfactory completion of the assessment be also made a condition of any planning permission given in this case. I suggest the report on this application ought include an update on the progress of that assessment. Councillors could make approval of this application subject to the full approval of 12/1537/FUL. My understanding is that the application 12/1537/FUL to which the current application is related has only been approved subject to conditions, and it is yet to be seen if those conditions can be met, particularly in terms of providing safe access from Milton Road. Many people made comments on the recently considered application 12/1537/FUL I would like to see those comments which are still relevant to this application carried forward and considered again in relation to this application. I don’t think it is reasonable for councillors to expect people to repeatedly submit comments on the same subject, and once submitted in response to one consultation exercise councillors and officers should ensure they are taken into account where appropriate. I note the consultation area for application 12/1537/FUL was wider than that being used for the current application. My prime concern in relation to 12/1537/FUL was the safety of the access from Milton Road, in particular the crossing of a busy cycleway. This new application does exacerbate the problems associated with that, in my view undesirable, access, albeit only fractionally as a proportion of the entire development. The application materials astonishingly reveal the council has failed to reply to the applicants’ attempts to find out which, if any, of the trees are protected by Tree Preservation Orders. This failure by the council has also impacts residents ability to comment on the plans from a properly informed position. I hope councillors considering the application ensure they are fully informed by officers about the protected status of the trees, and the reasons for that protection. I am concerned by the additional loss of yet more substantial healthy trees in the area. At Cambridge’s North Area Committee on the 3rd of July 2014 I asked about the “road safety assessment” which was a condition of the planning permission. I recorded the meeting, and am able to provide a link to my question. Richard Taylor: I’d like to ask the committee about the junction between Milton Road and the new development between Milton Road and Woodhead Drive. This is a junction I live relatively close to. Chairman Cllr Todd-Jones: Well we will certainly look into the planning condition at the junction; the other matter is highways perhaps for our county councillors. Cllr Price: Just so I’m clear chair, we’re talking about the latest development where the house was demolished on Milton Road and the houses were built behind. Cllr Onasanya: Thank you chair. In respect of the junction between Milton Road and Woodhead Drive I am happy to liaise with highways to see if the safety assessment has been done. Chairman Cllr Todd-Jones: OK. Thank you very much for that. Richard Taylor: I cannot find any information of the City Council’s ‘Public Access’ system regarding conditions on the development at the junction of Milton Road and Woodhead Drive. Can the North Area Committee please look into this? Councillor Onasanya agreed to liaise with County Highways regarding the safety assessment. These proposed minutes are inaccurate as I did not refer to the junction between Milton Road and Woodhead Drive but the junction between Milton Road and the new development between Milton Road and Woodhead Drive, which is a different junction. I will write to the committee officer named on the papers, my local city councillors, and the chair Cllr Todd-Jones pointing this out. I do wonder given Cllr Onasanya’s misunderstanding at the meeting if she had a hand in formulating the inaccurate proposed minutes. Cllr Onasanya doesn’t live in the ward so is perhaps unaware of the streets and developments within it. I will also note the item was not added to the committee’s action sheet. The proposed minutes for the July 2014 North Area Committee state that I asked a question about “the development at the junction of Milton Road and Woodhead Drive”. I actually asked if the safety assessment for “the junction between Milton Road and the new development between Milton Road and Woodhead Drive”, which was required under a planning condition, had been carried out. The junction between Milton Road and Woodhead Drive is not the same junction as the one between Milton Road and the new development. I would like to suggest the draft minutes being proposed are amended. I will write to my city councillors and the meeting’s chair too. I asked the question hoping to prompt the release of the safety audit to the public and to hear councillors’ views on its conclusions. There may be actions which can be taken, informed by the audit, to ensure the new junction is as safe as possible when it is built, signed, and marked up. There may also be things which can be done better in respect of future developments given that even if the audit concludes the junction cannot be safely constructed it appears to late to do anything. I don’t usually complain about inaccuracies in the minutes but in this case the wrong junction is referred so I thought it was a substantive error which needs correcting. The application for the additional house on the development is to go before councillors at the North Area Committee on the 28th of April 2014. Officers have told me that the draft minutes will be corrected (presumably subject to councillors’ agreeing) and that a response will be sought from the county council before the meeting. Cambridge City Council have written to me, on paper, to say they have granted permission for the additional house on the development. They state my comments were taken into account. The roadway in the junction has been raised so the cycle path crosses the junction on the level. The raised roadway makes it clear to drivers that they are crossing something; so hopefully it will prompt care to be taken. New curved curbs have been installed which cyclists on the cycleway will have to cross at a slight angle. The curbs are not flush, so this work has not been done with the care seen elsewhere in the city. The height of the curb is low, only a couple of centimeters which to a degree ameliorates this problem. I’d have preferred a totally flush junction between the areas and/or for the curbs / junction between materials to be at right angles to the flow of cycles. It appears cyclists will be asked to give way to cars at this junction. It’s great that the overall impression given by the junction closer to one of a driveway rather than a road, but it’s a pity that in respect of cyclists having to give way to cars this junction is being treated more like a road than a driveway. While the area where pedestrians and cyclists will cross the junction is raised the cycle path is not marked across the junction; marking it would, I would have thought help draw attention to the fact it is there to drivers. At the North Area Committee on the 30th of October 2014 I used two questions to chase up a response to my question which I asked on the 3rd of July. I used two valuable questions as chair Cllr Mike Todd-Jones’ initial response was to point to the minutes showing my question had now been correctly recorded. I had to use a second question to chase it up again, and request an answer. I strongly oppose the installation of gates. I opposed the development even being a private road; and wanted to see the development made permeable to cyclists and pedestrians. Gates will literally separate those living in the new development from those living in the surrounding area. I don’t think this is a positive thing. If the councillors think safety in the area is so bad they need to approve these gates on security grounds then they should improve things for everyone and not just the residents of the new development. Those delivering local political leaflets, and newsletters and notices of events will find it harder to get these to residents of the new development – isolating the residents of the new homes from those living near-by. It will make ad-hoc interaction such as carol singing, trick or treating, or visiting a neighbor’s house to obtain a ball, frisbee, quadcopter, which has accidentally gone over a fence more difficult and less likely to happen. Visiting neighbors to discuss matters of mutual interest such as trees in gardens, or parking, will be made harder by the gate. I am concerned gates will make it harder for visitors and delivery drivers to gain access to the development and lead to parking on the road, or verges, outside. The gates will exacerbate the problem of the new development not being a genuine extension of the city. I am concerned that residents of the new estate may, if it is behind bars, become more fearful of outsiders and the world at large. I think it will increase fear, and new residents may end up living more disconnected and frightened lives. I make these comments having encountered some of those living in Cambridge’s existing private, and gated, enclaves. The proposed installation of gates appears again subject to a further safety assessment (I can still see no evidence the first assessment has been completed yet). I, as a near neighbor and a commenter on the original application, have not been proactively informed of the latest application. I suggest local residents, councillors, and those who commented on the original planning application are informed of the application to install gates and given an opportunity to comment. Gated communities are not part of the current make-up of North Cambridge. Their introduction is contrary to many elements of the current local plan which in section 3/4 states “Developments will be permitted which demonstrate that they have responded to their context” and “be well connected to, and integrated with, the immediate locality and the wider City”. I suggested the next local plan ought more strongly oppose the creation of new gated communities. One of the ward’s local councillors, Kevin Price, gave an update on the safety assessment at the North Area Committee on the 18th of December. He said he’d forgotten to look into it. The ward’s County Councillor Fiona Onasanya was absent from the meeting. As someone who has off-road parking behind a set of electronic gates, it’s also enormous fun when they break. This seems to happen reasonably often in the rain. Since I only use the car parking space as access for the back garden, I can carry my bike through the house instead, annoying as it is. The drivers can’t do anything. In my experience, it’s unusual for this not to happen. I’ve checked the application’s page on the council’s website and there are no further updates yet on if permission for the gates will be granted or not. Today work done on Milton Road accompanied by a notice from Cambridgeshire County Council has included resurfacing the piece of road outside the new estate. I see what look like granite sets have been installed at the edge of the roadway. I think bricks, and other small blocks, are a bad idea for public roads as they so often appear to fall out or otherwise fail and end up in a bad state (for example in Cambridge see the brick surfaced Sidney Street). As for right now though the stone looks rather smart and I’m wonder who’s paying for it. Are we all paying? Did the council think it ought do a really smart job because of the £700K prices the homes in the new estate are on the market for? An additional observation is the give way markings for cyclists on the cycle path have gone. Earlier this week I was interviewed outside the estate for BBC Radio Cambridgeshire; who are planning to do a piece on Cambridge’s gated communities following this proposal for the first one in this part of the city. Are you just objecting for the sake of it? No. Actually when I got the notice of the planning application as a near neighbour I felt a strong civic duty to consider the proposals and comment on them; particularly in the interests of those who will come and live in the house I live in now in the future. There must be demand for this or the developers wouldn’t be doing it? I accept that my views might well not be shared by others, and I might have a very different outlook from those who want to, and are able to afford to, buy, or live in, a £700,000 new home within the enclave. The state of the housing market in Cambridge is such that people have to make compromises. People everywhere when deciding where to live have to balance up all sorts of options. I very strongly wouldn’t want to live on some of Cambridge’s new developments where extra fees and charges are levied to maintain the roads and run the green spaces, and where I’d have to pay council tax as well of course. That’s only one factor in the balance, if that’s where I could afford to live and there were other things going for it such as space, proximity to the city centre, and transport links I might go for it on balance. People will make all sorts of compromises in a pressured housing market; just because people ultimately decide to live somewhere doesn’t mean it’s good for them, or good for wider society. I think in the interests of who’ll be living in the city in the future, in the developments permitted by those of us who live here now, we need to consider what we think is acceptable and contributes positively to the city and what doesn’t. I note that currently a 4 bed house on the estate is being advertised at £695,000 and as yet the description doesn’t include the gates (as the proposal to put them in has not been approved); it will be interesting to see if the asking price rises once the gates can be promised. Even if developers can increase the amount people are willing to pay for the properties by adding gates that doesn’t automatically make adding gates a good thing. Another way of phrasing this question is: “if the market wants gates should the state intervene and say no?”. I am generally in favour of a free market and state interference only where there is a very strong case for it. I think there is a strong case here, on the grounds of ensuring the city functions; I think gates are a barrier to the normal functioning of a residential area. Overall without planning intervention I suspect (on the basis of listening to developers, planning officers, and councillors, talk about other sites in the city) that the most profitable thing for a developer to do is to build a small number of large luxury detached properties on central Cambridge sites. I think there’s a clear argument that planners should ensure what’s built reflects need, and when permission to use land is given we should look for efficient use of land in the city. If gates on this estate mean the houses here are worth more that will make your house worth more; surely you’d support something raising the value of your house? No. The potential impact value of my house is not a factor in my opposition to gating this development. (It’s also not a factor in my other comments). The suggestion put to me was that by opposing the gates I might be adversely impacting my house price. There were no gates present in the original plans; an no discussion of gates at the planning committee (as they hadn’t been proposed). 10. Notwithstanding the provision of Class A of Schedule 2, Part 2 of the Town and Country Planning (General Permitted Development) Order 1995, (or any order revoking, amending or re-enacting that order) no gates shall be erected across the approved access unless details have first been submitted to and approved in writing by the Local Planning Authority. Reason: In the interests of highway safety. 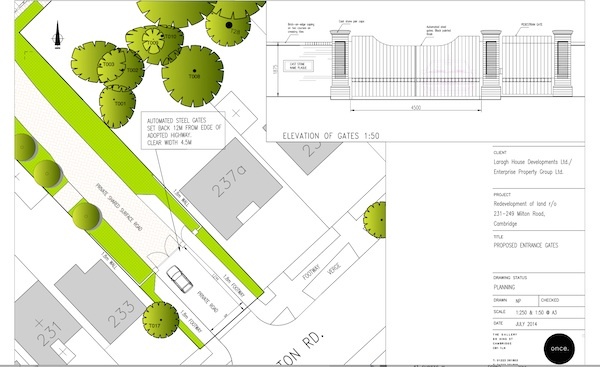 That doesn’t give permission for gates; and the submission for approval of the gates to the council is what I have noticed and drawn to attention here. It does look from the wording of that condition that the only reason for rejecting an application relating to that condition can be highway safety; which is interesting because it means councillors left themselves no way of stopping gates which would cause problems for refuse vehicles for example. If anything the planning condition is an extra safeguard against dangerous gates; it’s certainly not permission for them. @RTaylorUK @hesterkw may be a standard County Highways condition. 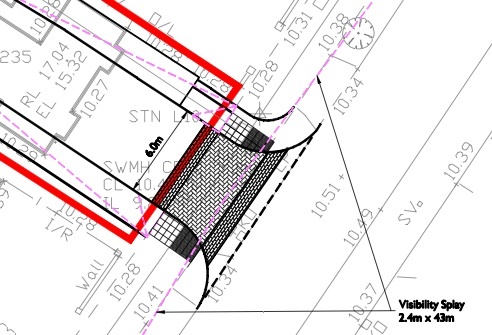 As for if the wall and gates will require planning permission themselves in their own right; I suspect they won’t as they’re set back from the site boundary, but presumably council officers will look into that. If the gates don’t require planning permission, and are “permitted development”, I think it’s a bit cheeky of the developer to submit plans and get approval, but then build something with significantly different character making use of what they’re allowed to build without permission. The plans for the gates were submitted to the council on the 14th of September; the council haven’t yet decided if to agree the plans or not, and haven’t responded to my objection even explaining how they will make their decision. I would like the matter to go back to councillors at a planning committee. @RTaylorUK There's stuff against gated anti-communities in 2014 draft plan but not in 2006 plan. Should be enough to turn such things down. 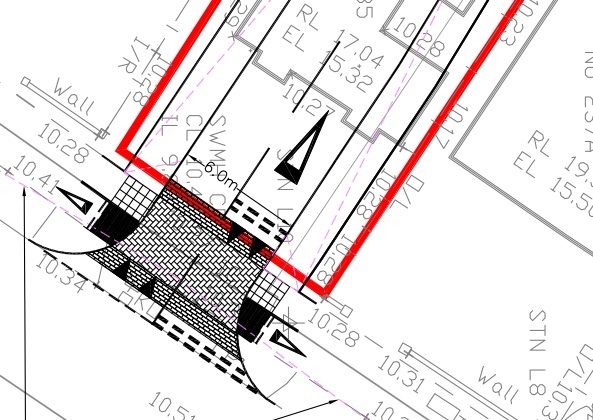 Further to Richard’s notes on the Twitter conversation, it is quite clear that the gates are not a separate application but simply drawings submitted for discharge of Condition 10 of the planning consent for the site. Also that there seem to have been no reference to gating off the access road in the actual application and that County Highways requested Condition 10 as part of their standard conditions in their response to the site application. The sole reason for refusing now would be that the drawings could not be approved on grounds of highway safety in which case alternative designs to satisfy that would simply be submitted. The principle itself of not gating off the development cannot be considered. So in effect gating it has happened by default due to the addition of a County HIghways planning condition about something which had not been part of the application itself. I think that rather a shame as it meant the principle of gating off this entire road was not debated at committee though had committee members picked up on the condition and queried it it could have been. Had the condition not been put in, I think the developers would have had to submit a new planning appplication which would have then meant those objecting – or supporting – to it could have ensured it came to planning committee and the developers would have needed to explain why they think it necessary. That could have included, for example, discussion on, if gates were given consent, where they actually are and if cutting off the road right at the entrance is right or reasons for thinking the development less secure without gates. The problem the City Council, and I imagine County Highways, also have is that planning inspectors pretty regularly overturn refusals of gated communities, both generally and also in City, including in August last year. The current Local Plan says nothing about gated communities and the draft new Local Plan only contains one sentence at the end of para 7.7 in the supporting text for Policy 56 which says: The creation of gated developments that limit social cohesion and integration will not be supported. Given that even recent refusals by CIty on the grounds of limiting ‘integration’ have been overturned by inspectors on appeal it wil be interesting to see if this stands and can outweigh those appeals. I do think that gating off entire roads or cul de sacs is something that should be resisted and does little to help integration but if it does happen it should be clear from the outset and not, as here, by default because of a planning condition. I don’t think merely mentioning gates in a condition amounts to giving planning permission for them. It will be interesting to see what councillors’ and planning officer’s views are. (Or the views of the planning inspector as the council are already very late deciding what to do about the “submission” describing the dates so an appeal is possible). I know you do not think that but in planning terms Richard you are quite simply wrong. A planning condition is simply what is required to be done in order for the development to take place. In this instance submit an acceptable design for gates and they can be built. And officers discharge conditions not planning committee except if called in or specified at time of consent. So if you think this one should go to committee you should request it though even then it may not. Otherwise it will simply be discharged at some point. submit an acceptable design for gates and they can be built. That’s not what the condition says. no gates shall be erected across the approved access unless details have first been submitted to and approved in writing by the Local Planning Authority. I was on BBC Radio Cambridgeshire’s breakfast show on the 19th of January 2015 with host Dotty McLeod talking about my opposition to this development being gated. Also on the show were Conservative Candidate for Cambridge’s MP Chamali Fernando and my ward councillor in King’s Hedges Labour’s Kevin Price. Dotty McLeod: Kevin. Is there a solid reason for a development anywhere in Cambridge, maybe specifically in King’s Hedges, to have lockable gates like this? Cllr Kevin Price: None that I can think of. None at all. It’s beyond me why people want to live behind gates. You then separate yourselves from the community and it just strikes me as not a very good idea at all. Dotty McLeod: The developers clearly see a market for a gated development because otherwise they wouldn’t be building one so some people do want these gates. Cllr Kevin Price: Well I expect it gives them an air of superiority and exclusivity. That would be my view. Look at us we’re behind these gates and you lot can’t come in. You can’t walk round our street and you can’t post your leaflets through our doors. I just think that Kings Hedges, Cambridge, is the wrong place for that. Dotty McLeod: This development was approved of course in order for it to be built. The planning application was approved. Did you know it would have gates like this? Cllr Kevin Price: At that time, no. I have to say we didn’t know about the gates. I actually went to the planning committee and objected to the development on several grounds. Gates were not one of them I have to say. Dotty McLeod: But if you had known they would have been another reason against it in your view? Cllr Kevin Price: Exactly. That would have been something I would have raised as well. Well- planned buildings, streets and spaces are fundamental to the creation of high quality development. There should be a holistic approach taken to the design of buildings, streets and landscape to ensure that these elements integrate well with each other. The creation of gated developments that limit social cohesion and integration will not be supported. I’m fully in favour of that. I suspect the debate on this development becoming gated wouldn’t have occurred if I hadn’t spotted the submission from the developers and drawn attention to it. @CambridgeLabour @cllrmartinsmart As Cllr Price has come out opposing gating Middleton Green development will planning ctte consider matter? Cllr Kevin Price doesn’t tweet, but he does use Facebook; but his settings are such I can’t comment on the post he’s made about this interview. One person interviewed in the piece, an estate agent, said: “right now people particularity in France and Belgium are dying for the most appalling reasons. Are we really needing to get het up because a development has gates on the front?”. I think he’s exaggerating the situation where two people have been killed by the police in Belgium and in a separate incident eleven people were murdered (and more injured) in Paris before both perpetrators were shot dead. There is not an ongoing continuum of deaths, it is not an epidemic or a war. I’ve said above that I feel a duty to take part in decisions about my local area when I’m given the opportunity to do so; I think it is the right thing to do in the interests of society. That doesn’t mean I think the gates are the most important issue. I also want to spend my time and effort where it will have most impact; I want to significantly change our society in all sorts of ways. At the core of what I want is a fairer and more meritocratic society with more individual freedom. I want to challenge injustices I have experienced and am aware of and want to help as many people live as happy and healthy lives as possible. On a larger scale we, as the most capable element of the living goo on the surface of this planet, have a responsibility to take life off this rock; I share my seven billionth of the responsibility for that. The way we democratically run our society means, I think, that if you want to have an influence on the strategic direction our society takes you have to take an interest in local matters – the planning decisions, tree felling proposals, local police priorities, individuals’ battles with the state and more. I’m not cynically taking an interest, I genuinely have an interest in my local area, not only do I live in it but the vast majority of my net-worth is invested in it. There’s also the question of journalists picking what they want to focus on, and what they, rightly in this case consider to be controversial issues that will prompt debate. I think they decided to go along with that. To clarify that appears to be a condition officers proposed in relation to another site; which the commenter thinks councillors agreed. It shows that gates could have been precluded in a condition. In this case officers and councillors had no reason to imagine anyone would want gates. That refers to 1 Ditton Walk where the developer plans for gates. considered acceptable for highway safety purpose, were rejected by the planning officer and also committee on the grounds of causing a lack of ‘integration’ with the community and to avoid the creation of a gated community (reasons stated under the Condition , which was No 3). That condition was overturned by a planning inspector in August 2014 allowing the gates to be installed. Appeals like this are why it is hard to sustain refusals of gated communities. Also see the directional arrows which have been painted on the road. I have now contacted the planning department and the reply I’ve had confirms that the safety audit dated the 5th of February 2014 for the new junction off Milton Road has been carried out by the county council’s road safety engineering team. That audit was carried out as part of the County Council’s powers under the highways regulations under the Highways Act. This safety audit raised several safety problems with the junction and made several recommendations to mitigate the problems which the applicant has agreed to implement to improve safety. Typical, but not universal, practice is to ask those who raised the original point if they want to make any comment on the reply when it is provided. Chair Cllr Todd-Jones did not make this offer to me at the meeting. No councillors made any comment on the response. Most notable was no reference to the gates in Cllr Price’s response; if the safety audit was carried out in February 2014 that was a year before the gates were proposed so presumably the impact of the gates has not been considered. There isn’t a clear answer on if the condition requiring the safety audit be carried out and approved has been discharged though it sounds as if it probably will be (if it hasn’t been already0 once the developer demonstrates they’ve addressed the points raised in the safety assessment. There is no explanation as to why the council’s online information about this planning application does not clearly explain the status of the application, and the safety audit. The audit itself, correspondence relating to it, and any letter from the council discharging the relevant condition is not present. I also note (as I’ve just looked at the online file) and according to that council are still yet to respond to the application involving the gates which was submitted on the 18th September 2014 and which the council promised the applicant they’d respond to within 12 weeks. It appears though the online planning file is not being kept up to date with all the documents which should be included on it. The details state “with consent for the erection of a detached two storey dwelling”; again I haven’t specifically been consulted and I had not seen any notices about the proposal despite living very near by and having commented on the previous applications on the development. This site is between the initially approved development and the first additional plot to gain planning permission. The house the plot is being separated from is on-sale for £750,000, so if both elements of the plot go for the asking price that’ll make it a £1m property. The first £1m property on Milton Road according to Zoopla. There is a question of if this development has genuinely grown organically as more land has become available, or if the breakdown into a series of planning applications has evaded the affordable housing provision requirements. The council’s current affordable housing policy only requires affordable housing provision on developments of 15 or more dwellings. The initial application was for 13 homes, and now two more have been separately given permission. (Although the property demolished would be subtracted from the total, so the threshold would not yet be reached). Cambridge City Council’s policy states: “The City Council will not permit any benefit to be gained from the artificial sub-division of sites to duck beneath the qualifying site threshold.” I don’t know what that means in practice or if it just empty words. Affordable housing should be provided on all housing development sites of 0.5 hectares or more and in all developments including an element of housing, which have 15 or more dwellings. The policy applies to all types of development where dwellings are proposed including the development of retirement homes for sale, but not to sites where the only development to be provided will be in the form of a student hostel. The latest application states that the road is a private road. Those who own the road can presumably control who build new properties on land which is only accessible from the road; that’s an interesting aspect of what’s happening here given some existing residents have objected to the plans for the additional houses. We wish to make planning aware that the application submitted includes a strip of land owned and managed by Middleton Close (Cambridge) Management Company Limited, land which we currently have no plans to sell. The fact the properties are currently under construction suggests the access issue has been resolved.